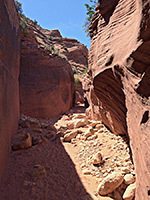 Wire Pass is a short drainage that joins the much longer Buckskin Gulch slot canyon, and provides a convenient entrance point, enabling hikers to bypass the upper four miles of the gulch which are shallow and less interesting than the 12 miles downstream. 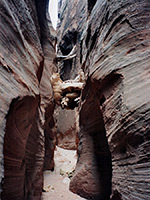 From the trailhead, the streamway is 1.7 miles long of which about half a mile is through a slot canyon, parts of which are less than three feet wide; narrower than Buckskin although not nearly as deep. 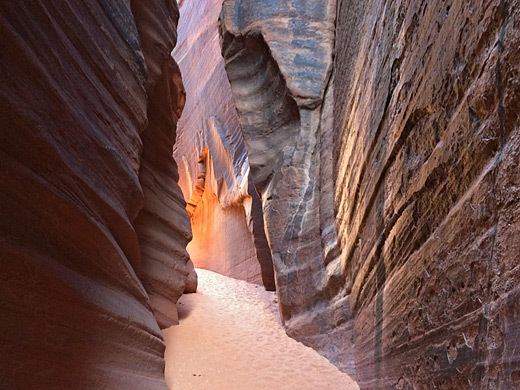 Because of this, the sun illuminates the curving sandstone walls more extensively, sometimes reaching all the way to the floor and often producing nice reflected effects - so photographs taken here are good, and somewhat different to those of the gulch. 8.5 miles south along the unpaved but generally good quality (when dry) House Rock Valley Road, starting from US 89 - see the page for Buckskin Gulch. 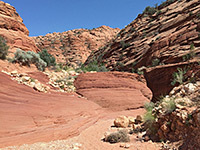 For most of the first mile from the trailhead, the walk is along a wide, meandering streambed between low reddish cliffs, over soft sand that makes progress rather difficult. 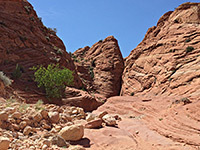 Signs discourage hikers from taking short cuts across the grassy banks inside the bends of the stream, since this can cause erosion, though the first quarter of a mile is above the wash, along a path on the south side. 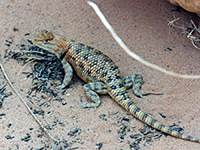 There is not much to see at first, except wildflowers and occasional wildlife, most noticeable being lizards; the drainage is home to quite a few examples of the desert spiny lizard, a species more interesting than most, decorated by colorful patches of orange, black and blue. 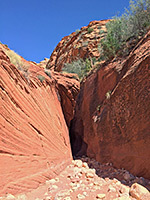 After walking just over half a mile, on the inside of a wide U-bend, a trail leaves the wash to the south, climbing the cliffs and continuing to the famous formation of The Wave, in the North Coyote Buttes region. 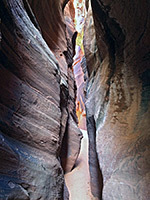 The surrounding cliffs become gradually higher and closer together, and the last half mile includes two short but deep stretches of narrows, the first of which contains an eight foot drop, relatively easy to negotiate, though conditions can change after floods. The obstruction can be bypassed if required, using an overland route on the south side. 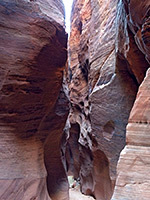 The initial slot extends for 600 feet, leading to an open, boulder-strewn section of streambed, still enclosed by vertical walls, while the second is somewhat shorter, though the cliffs are taller. At the end of the second slot the ravine opens out suddenly at the confluence with Buckskin Gulch; downstream is a deep and enclosed one mile section before the gulch becomes quite wide for a while and so this would be a good target for a half day hike, for those who want just an introduction to the Buckskin canyon system. The cliffs around the confluence (south side) are marked with several big horn sheep petroglyphs. Even in the relatively shallow drainage of Wire Pass, flash floods of great force do sometimes occur as demonstrated by a number of logs jammed several yards above the floor in the narrow sections, although they have probably been there for many years - dangerous floods here happen very rarely. 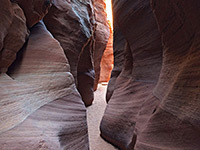 It is easy to climb the cliffs above the narrows to the plateau, from where it is immediately obvious why such slot canyons form; the land is almost all bare rock with little vegetation, just weathered, undulating Navajo sandstone in most directions. 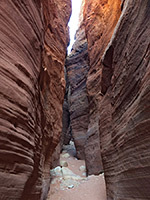 There is nowhere else for rainwater to go and all soon flows down the one canyon, producing a deluge with great erosive power.